Handmade in Nicaragua, Acid Krush Gold Sumatra cigarillos are infused with a secret blend of herbs and botanicals to create an amazingly unique flavored cigar experience. Small in stature and flush in one-of-a-kind taste, Acid Krush cigarillos are sure to satisfy. 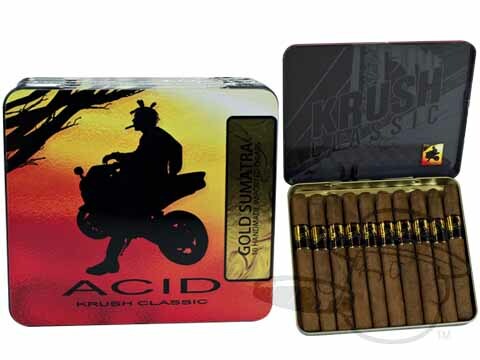 Acid Krush Gold Sumatra delivers the earthy-sweet taste of Acid Gold in a convenient 4x32 cigarillo. This is a great mid bodied cigar. A little stronger than the Blue Connecticuts but milder than the Red Sumatras. These are the gold standard of a cigar on the go. Great short smoke with am coffee or any time. Always consistent and satisfying. Very pleased with this product, never dissappointed. Nice flavor, mild smoke and just the right size. Would purchase again. While I normally smoke the Acid Krush Blue Connecticut, I wanted to try the Gold Sumata. It's a deeper, stronger flavor but will very enjoyable. I usually smoke Acid Blonde or Blue Connecticut Krush. I tried the gold sumatra. Stronger flavor, which is fine, but burns harsh. Probably won't but again. Well constructed and a tasty smoke. My husband loves these cigars and the value is great! These cigars arrive fresh and each tin has a package to keep them fresh. Great aroma and flavor. In fact I just made another large purchase from theses great folks! Thank you!! Acid Krush Gold Sumatra is rated 4.5 out of 5 based on 20 customer ratings.